If there's a single common stereotype of radio actors, it's their versatility. Even half a century after the end of the "old time radio" era, the image persists of the busy but anonymous actor hustling from studio to studio -- on foot, in taxicabs, on a bicycle -- racing all day long from this program to that program, from this role to that role, pausing only to gulp a cup of coffee and bolt down a lunch-counter sandwich between performances. It's an appealing image, the hustling, unsung professional as the backbone of an entire entertainment medium. And unlike a lot of legends, a lot of stereotypes, there's a lot of truth to it. There really were actors and actresses like that, especially in New York and Chicago, for many years the primary home bases to radio drama. Even after the infusion of Hollywood talent changed the complexion of big time radio in the late 1930s, the East Coast and the Midwest remained essential points for the creation of dramatic programs. And among the actors who lived that fast-moving microphone-to-microphone way of life was a rich-voiced gentleman named Les Damon. Les Damon is best remembered for his detective roles during the 1940s and early 1950s, but he didn't spend all his time on the air on the back end of a revolver. He was a versatile player in all manner of radio dramas dating back to the 1930s -- a career that drew him in as it did so many other young hopefuls with theatrical aspirations during the slow years of the Great Depression. Born in Rhode Island in 1908, young Lester Damon began his stage career with the most rigorous apprenticeship possible, touring with a regional stock company. Every night a different stage, every night a different role, every night a different audience -- and every night a chance to hone his developing skills. In some productions Damon was a leading man, in others he tackled character roles, and by the time he made his way to England to continue his apprenticeship there, he was a thoroughly seasoned actor. Michael Waring is the freelance investigator, troubleshooter, and adventurer known to one and all as The Falcon. One part The Saint, one part Boston Blackie, and one part Philip Marlowe - Waring can be suave and charming, especially when a lady is involved. But, there's never any doubt about his nail-spitting toughness, nor of his impatience with the plodding methods of the police - most often expressed in an endless stream of clenched-teeth wisecracks. Les Damon brings an ever-so-slightly-world-weary tone to the title character in 15 of these digitally remastered and restored radio episodes, with James Meighan making one appearance as The Falcon. 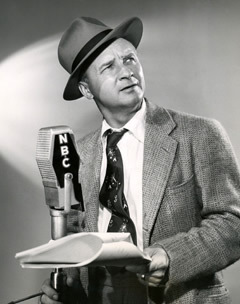 Also heard in these broadcasts is radio regular Jackson Beck and announcer Ed Herlihy. 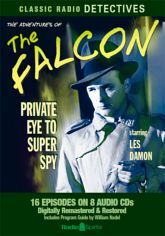 Cherub-faced, blue-eyed World War II hero Les Damon plays detective Michael Waring - better known as The Falcon. Damon played the role with style, pulling off the character's transition from private eye to Army Intelligence operative with panache. This collection of 16 digitally remastered episodes begins with Waring's wars against domestic enemies, including gambling bosses, arsonists, con artists, drug dealers, and killers. And, it's just those exploits that prepare him for his work as a spy - flushing out traitors and impersonators, protecting endangered allies, and tracking down communists threatening the free world! As the 1940's dawned, Damon also found his way into more prestigious roles in nighttime programs. By this point the biggest dramatic showcases had moved to Hollywood, but there were still plenty of nighttime dramas originating in New York, and with every actor who followed the lure of the dollar westward, that meant that much less competition for those actors remaining in the East. Les Damon was among those hustling for those New York based roles, and he landed his most prominent part yet in 1941, when producer Himan Brown cast him as the suave criminologist Nick Charles in The Adventures of The Thin Man. Here, Damon stepped into the highly polished shoes of the movie Nick, William Powell, and managed to capture the charm of the screen actor's version of the role without stooping to slavish impersonation. And his performance was greatly helped by actress Claudia Morgan as wife Nora, a fully acceptable substitute for Myrna Loy. The Adventures of The Thin Man caught public attention in those last months before the U.S. joined the war, for the sparkling personalities of its leading actors as well as for the obvious affection Nick and Nora shared over the air -- the program was notorious for its "squeaky kisses," the enthusiastic expressions of affection the lead characters exchanged in nearly every episode. It was Les Damon's breakthrough role, but Uncle Sam had other plans in mind for the busy actor. In 1943, Damon received his official Greeting, and entered the Army Air Force -- where, after a period of active service in the air, he ended up on the staff of the India-Burma Network, a sixteen-station outlet of the Armed Forces Radio Service. Technical Sergeant Damon wrapped up his war service at the IBN outlet in Bhamo, Burma announcing live spots between transcribed rebroadcasts of stateside programs, along with news broadcasts, interviews, and other assorted local features. 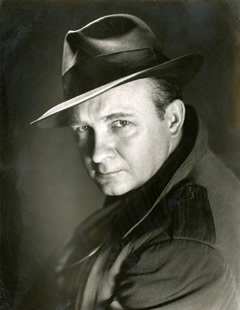 Damon returned home in 1946, reclaiming the role of Nick Charles from Les Tremayne, who along with David Gothard had filled the part in his absence, but he only remained in the part for one more season before moving on to his next job. He had plenty of work to do in these postwar years -- the New York soaps were as busy as ever, and there were plenty of nighttime roles. Damon freelanced over the next few years, turning up in programs ranging from the prestigious Cavalcade of America, where he was practically a regular, to the sudsy The Second Mrs. Burton. Then, in 1950, he landed his second major detective role -- taking over as ladies' man-private eye Michael Waring, better known as The Falcon. The kisses weren't quite as squeaky as they'd been during his Thin Man days, but Waring was every bit the suave romantic as Nick Charles had been. Damon replaced Les Tremayne once again in taking on the part -- the two actors had been blessed with extremely similar voices -- but Damon quickly made the role his own, starring in the series for more than two years. 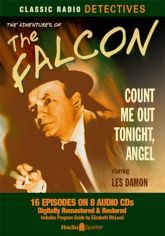 The Falcon was, in most respects, a slicker series than The Thin Man had been, and Damon turned in a highly polished performance as Mike Waring, even when dealing with the "integrated commercials" featured by sponsor Kraft Foods (during which Waring would drop everything to discuss the state of his current case with lunchroom proprietor Ed Herlihy, who seemed far more interested in talking about Miracle Whip). After leaving The Falcon in 1953, Les Damon still wasn't finished with radio. He reunited with Claudia Morgan in 1955 for an extremely Thin Man-esque comedy-mystery series called The Adventures Of The Abbots, complete with squeaky kisses and an earnest attempt to recapture the chemistry of a decade earlier. And he moved into a new genre, establishing himself as a regular member of the stock company at NBC's adult science fiction showcase X Minus One. But, like most radio actors during this period, Damon also had his eye on television. Blessed with generic good looks (without coming across as too handsome), Damon moved easily into the new medium. He took on roles in the television version of The Guiding Light, and new serials such as Search For Tomorrow, The Edge of Night, and As The World Turns. He even appeared in occasional character parts with Jackie Gleason, in both the comedian's regular variety series and its legendary spinoff The Honeymooners. Like so many actors of his generation, Les Damon never really stopped working. He was still busy, still active, still taking on new roles when he died of heart failure at the age of 54. Damon passed away just two months before the symbolic end of the Old Time Radio era itself -- a man who had symbolized the hard-working professionals who had made that era happen. Copyright 2014 Elizabeth McLeod and RSPT LLC. All rights reserved.